Lapidary hobbyists, Jewel designers and rock polishers have one thing in common and that is Rock tumblers. I myself have been involved in jewel design for years now. Following my path my son too wants to get into this profession. His birthday was near and I couldn’t think of a better gift than a rock tumbler. I hunted the web for good quality, durable and Double-barrel rock tumblers and internet flooded me with options. I came across the new Lortone 33B Rotary Rock Tumbler on Amazon. It checked all the boxes and I bought it instantly. The rock tumbler is double barreled that means you do twice the work in one go; polishing and grinding. The metallic body is tough and proves to be durable. Being a small machine drops are common, the metal body protects the machine from damages. The strong motor lasts long and doesn’t interrupt the grinding process. The machine comfortably grinds with no motor issues. Highly portable. The design is fit for purpose, easily carried to sites and work stations. The capacity is enough to load up to 3 LBS of materials and polish up to 3 LBS both at the same time. 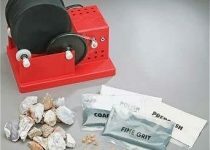 This rock tumbler also comes with a warranty of 1 year. The price is a little towards the higher side. 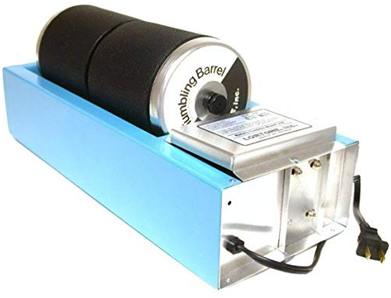 If you are not an extensive user of the rock tumbler, an extra barrel won’t help in any way. You’ll need to buy a plug socket separately as the plug with the machine won’t connect to a lot of ports. The paint tends to ware of after drastic usage. Scratches and dents can easily get to the body of the machine. The abrasives, if not handled carefully can be damaged. It is always prefers to carry it boxed. It’s been 6 months since I and my son have been using this product. We have had a lot of really good times and some bad moments with the rock tumbler. Here are some comprehensive Lortone 33B Rock Tumbler Reviews on its functionalities and features. I thought it was important to get the word out so you are not confused like I was when I got the product. Lortone started on a small scale engineering hand made rock tumblers for lapidary enthusiasts. 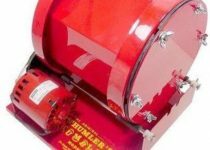 Now, it is counted amongst the leaders of manufacturing rock tumblers, saws, polishing arbors and an array of abrasives. All their products have been produced in America since 1978. Major chains in the United States of the company can be found at Mukilteo, Washington and North of Seattle. Lortone 33B rock tumbler is the flagship model of Lortone in the rock tumblers category. It is double barreled, can load more stoners and take a load off your back by doing twice as much work. The barrels are interchangeable and can easily be switched between. The tumbler is made for professionals but a novice can also get a grip of this machine in no time. 2 barrels each with a capacity of 3 LBS taking the overall capacity of the tumbler to 6 LBS. Can polish more than just stones. Lortone 33B polishes stones, jewels, glass and beads. The body is premium and coated with good quality paint. A motor with capacity; 115 volts. There have been mixed reviews about the product. Where on one hand a lot of individuals have loved the features the Lortone 33B motor provides, other have found issues with prolonged usage. A husband bought it for her wife who is a jewelry designer as a gift. She was happy with the functioning of the product. The usage was also not very extreme. She used only about 2 LBS of rocks to grind. It wasn’t long enough when the initially installed belt gave up on her and broke. The Lortone team was very helpful in hearing her issues and providing a quick support. Another customer had a hard time using the rock tumbler. He reviewed that although the functioning of the tumbler was good but when used optimally it heat up. Rather than using it in an enclosed atmosphere he took it out and had to stop work for the motors to cool down. The heat up happens because of the pressure that’s put on the machine from grinding. It’s general, if extends for long, the Lortone customer service is always there. Hope the review was helpful. I would suggest before buying a tumbler to check it’s specifications and your usage first. The Lortone 33B rock tumbler can a viable option only concern being budget. 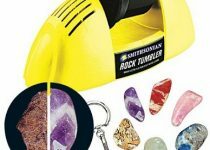 Rock Tumbler Reviews 2019 Copyright © 2019.